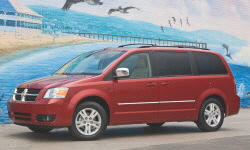 The 2010 Grand Caravan has been OK, but I would not buy another one with automatic doors and the 3.8L, V6. The 3.8 is underpowered and strugles at TX intetstate speeds. In NC, with lower speed limits, it doesn't struggle near as much. We've driven it from TX to TN and TX to NC. It rode smooth and fairly quiet. The fuel mileage wasn't bad on either long trip. My wife did all the driving to NC and she was not sore or tired from the handling, ride and comfort. 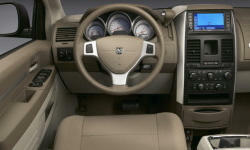 Why the 2010 Dodge Grand Caravan? This van has the 3.8L V6. It is very under power at 198 HP. The transmission bucks & bangs at inconsistent intervals. Sometimes it will do this a couple days in a row, then not for a week or more. The fuel mileage is not too bad. Overall the van seems to be put together well. We've had it for a couple years & 36,000 miles with no ratles or squeaks. Be very leary of the automatic door and tailgate opening/closing option. The van will open one of the side doors or tailgate after you have walked away. It will also close on you with no warning and no safety stop. The Sto and Go feature is great! With the seats folded flat in the floor there is a very impressive amount of storage. It's also very easy to fold and raise the seats. Why Not the 2010 Dodge Grand Caravan? Very underpowered with the 3.8 L V6. The transmission is clunky, bucks and slams into gear at times. It doesn't do it all the time, but at inconsistent times. The kids love the captain seats. They are as comfortable as the front seats and recline. Our son is 6'3 and has enough room to be comfortable.